My hands are still tingling from having wrestled around the snowblower for the past hour or so. The weather people predicted we'd get 3-5 inches, which usually means we'll get 1-2. But this time, we got the full 5, maybe even 6. It was a lot. I came to the realization, while snowblowing our almost 1/10 mile long driveway, that I would not have the patience to snowblow a cute, short driveway, like the one we had in Minnesota, or the ones our parents and siblings have now. All that stopping and turning and starting again... Of course, if we had a cute little driveway like that, we probably wouldn't own a snowblower. As it is, snowblowing our driveway is almost meditative. I do enjoy it. Although that tingling is making it a little difficult to type right now. The kids had a late start this morning (I'm writing on Friday), due to "treacherous road conditions." Sounds so...treacherous. About an hour before he had to leave, AKD asked me if I thought we should attempt to clear the driveway before he went to school. I told him to look outside and tell me if he thought we needed to. He thought not, partly because he drives a 4 wheel drive vehicle, but mostly because he's a pro at procrastination. So I put it on my to-do list. And then I crossed it off my to-do list. One of the completed items on my 18 for 2018 list was to obtain and begin using a to-do notebook. I picked one up at the dollar store. Isn't it pretty? Pretty is an essential quality for a to-do notebook, don't you think? The idea is to just keep a running to-do list, in one central place, instead of on little pieces of paper all over. I think I must have originally, subliminally, even, gotten the idea from my mom. She writes things down in notebooks. In my to-do notebook, I just write down things that I need to do, as they occur to me, and then cross them off when they're done. When the two facing pages that I'm currently working on are mostly crossed off, I'll transfer any remaining items to the new page and go from there. Here's what I like about my to-do notebook. The notebook is a lot more difficult to lose than random pieces of paper. I can write things down when I think of them, even if I know I won't get to them today, beause it's a running list. I never felt like I could write future to-do items on my random-pieces-of-paper list, because there wasn't room. Future items were written on their own random-pieces-of-paper, which were then subsequently misplaced, and found weeks, months, or even years later. I always have something to do during those random pockets of time where I've finished a task, and I'm not quite sure what to do next. I just check my list to see what I can get done in the amount of time I have available. It's handy for writing things down when they occur to me in the wee hours of the morning, which, in turn, (usually) helps me get back to sleep faster. That would never happen with a random-piece-of-paper list, because the random-piece-of-paper list doesn't exist until the civilized, waking up hours of the morning. At 5x7 inches in size, my to-do notebook fits nicely in my purse, so I can carry it with me. You may be wondering why I don't keep my to-do list electronically. The truth is, I kind of do. If there is something that I need to do on a specific date, like add money to the kids' meal accounts, or pay a bill, or check on the status of my chick order, I will set a reminder in my google calendar. Google will then remind me to do the thing on the correct date, via a notification on my phone that doesn't go away until I complete the task (thank you, google). 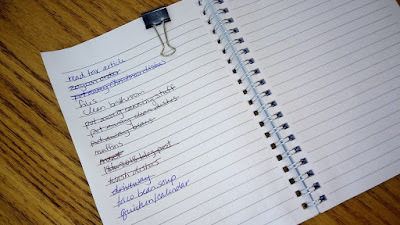 But for this list, the do-these-things-sometime list, I prefer paper, first, because it's easier for me to see the list and interpret the entries at a glance on paper, and second, because it's easier and faster to write something down than to wake up my phone, unlock my phone, click on the little google microphone (my phone is not always listening to me), tell google to put something on my list, and then check to make sure that google got it right. Retrieval is a lot faster on paper, too. I guess there's a third reason, which is that I don't always have my phone on me (I know. Unheard-of these days, but true), and since the notebook is brightly colored, and bigger than my phone, it's easier to find. Anyway, I wanted to share, because I've found my to-do notebook to be so helpful in the month or so that I've been using it. I don't use it every day, but I do feel like my days go so much more smoothly when I do. What about you? Do you think this low-tech solution would help you feel more on top of things? Let me know if you try it!